Request a meeting with Hon. Hon. Dorothy Pine-McLarty, O.J., has served, furthered and distinguished MFG for decades. She skillfully and notably helmed the firm’s real estate department until 1995—and then transferred to our London branch to become that location’s inaugural managing partner. After three years dedicated to progressing MFG’s practice in the UK, Mrs. Pine-McLarty returned to Kingston to head up the Conveyancing department for the next several years. Today, she is widely regarded to be at the pinnacle of Real Estate law in Jamaica and also actively practices in the areas of trust and estate law. 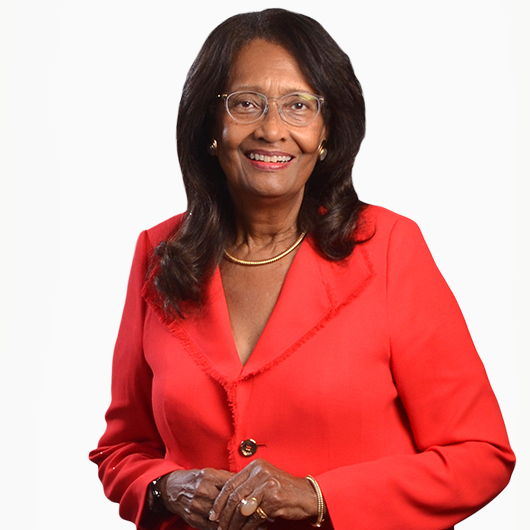 Mrs. Pine-McLarty is additionally an esteemed, independent member of Jamaica's Electoral Advisory Committee. On October 15, 2007, she was conferred with the Order of Jamaica (the nation's fourth highest honour) for outstanding public service.